Buckwheat waffles are a wonderful gluten-free breakfast that everyone will enjoy. In this recipe, the crispy squares are kicked up a notch with a delicious Greek yogurt glaze, plus a homemade (and extremely easy!) strawberry-cherry compote. What is buckwheat exactly? While the ingredient's name may suggest that it's related to wheat, it's actually not a type of grass at all. The edible part of the crop is a fruit seed that's related to plants such as rhubarb. The seeds that are used to make the flour are a complex carbohydrate packed with added health benefits from its relatively high magnesium and iron content. It's also full of fiber, which is great for digestion. Once the seeds are milled, buckwheat is often used to make bread and Japanese soba noodles. 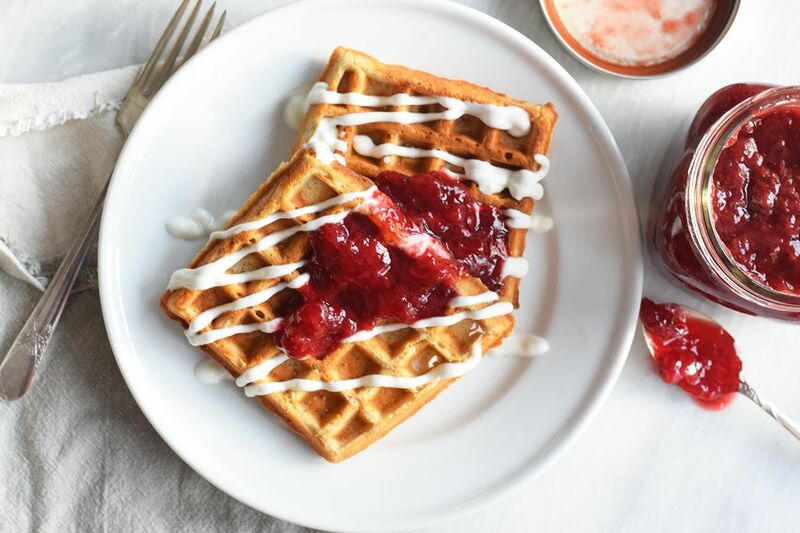 It has a great texture that's similar to regular flour, so it's a great alternative for those who are living gluten-free, but still want to enjoy dishes like waffles and pancakes. It has a nuttier flavor than regular flour so ingredients like strawberries and cinnamon complement them nicely, but if you're in a time crunch, feel free to serve them with maple syrup or even peanut butter! Combine the buttermilk, egg, butter, and vanilla extract in a measuring cup and whisk until completely mixed. Slowly add the buttermilk mixture into the flour mixture and stir to combine. You can leave some small lumps. Be careful not to overmix the batter as it will become tough. Heat your waffle iron to the highest setting and then grease it with butter or cooking spray. Add the right amount of batter for your waffle iron (each one is different) and cook until golden brown. Keep the cooked waffles warm in a 250 F oven as you prepare the rest of the batch. While the waffles are cooking, combine all of the compote ingredients in a small saucepan. Cook on medium heat, stirring occasionally until it has thickened, about 10 minutes. Keep it hot on low heat if it's done before the waffles are finished. You can store the leftover compote in the refrigerator for a week and serve it on other breakfast foods! Whisk together the Greek yogurt and powdered sugar in a small bowl. If you want to do a neat looking drizzle, place the glaze in a squeeze bottle. Drizzle the glaze over the cooked waffles and then top with the strawberry compote. If you are feeling super indulgent, add a dusting of powdered sugar. Enjoy immediately! Make Extra Fluffy Waffles With This One Weird Trick!